Fastest Speed. Furthest Coverage. Easy Setup. Enter a new era of wireless performance with faster-than-incredible speeds, the widest-ever coverage and more control and security than you ever thought possible. RT-AC87U delivers the world's fastest speeds of up to 1734 Mbps at 5G Hz — even faster than tri-band 3x3 routers — plus class-leading concurrent 600 Mbps speeds at 2.4 GHz for an amazing total bandwidth of 2334 Mbps! This means RT-AC87U gives you lag-free online gaming, silky-smooth 4K/UHD video streaming, and effortlessly copes with even the most bandwidth-demanding tasks. With a separate high-gain antenna for each of the four spatial data streams, this power-packed router gives you true 4x4 multi-user MIMO (MU-MIMO) wireless performance that smokes the competition — and it delivers top performance for all your wireless devices, even those using older Wi-Fi standards. 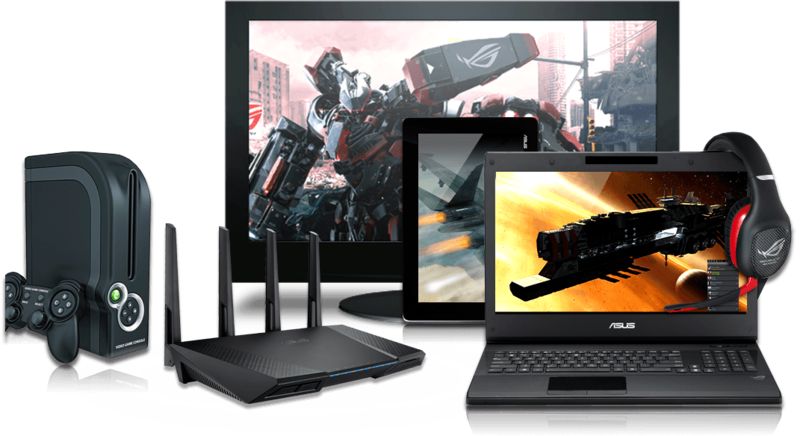 As with all ASUS networking products, you get the very best support with the widest range of device compatibility, plus free firmware updates for years to come — so your RT-AC87U will always be at the forefront. 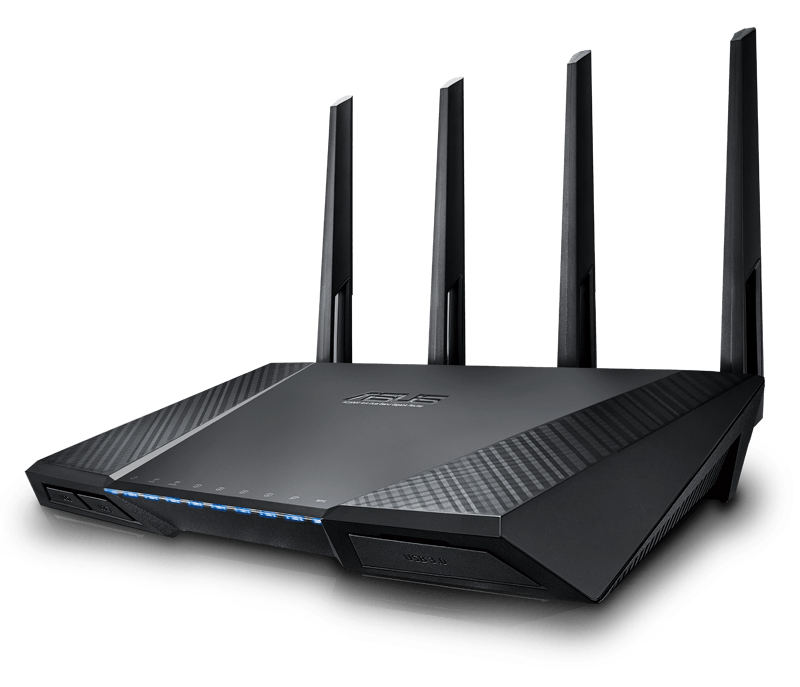 Enjoy a new level of wireless performance, with 2334 Mbps of combined 802.11ac and 802.11n bandwidth. With class-leading speeds of up to 600 Mbps on the 2.4 GHz band — thanks to Broadcom® TurboQAM™ technology — and up to 1734 Mbps concurrently on the 5 GHz band, which is even faster than the latest tri-band 3x3 routers, RT-AC87U leaves the competition standing. RT-AC87U doesn't lead others, it dominates, offering the best current-generation performance for all your notebooks, smartphones and other wireless devices. RT-AC87U, like all ASUS networking products, is subjected to exhaustive compatibility testing during its development. RT-AC87U works flawlessly with a vast range of adapters, media players and other wireless devices to ensure the best performance — it even supports the latest-generation Xbox® One and PlayStation® 4 game consoles. With its massive data pipeline of up to 300,000 data sessions, RT-AC87U has around 20 times the networking capacity of conventional routers for exceptionally smooth performance. Supports Time Machine® backups with Apple devices. Configure a VPN server or turn your network-connected devices into VPN-enabled clients — with PPTP and OpenVPN protocol support — with no need for paid VPN services or a dedicated VPN server. ASUS AiCloud keeps you close to your data wherever and whenever you have an internet connection. It links your home network and online storage service9, giving you access to your files using the AiCloud mobile app on your iOS, Android smartphones or via a personalized browser URL. You can share photos instantly to services like Facebook, Flickr or Dropbox directly from the AiCloud interface. 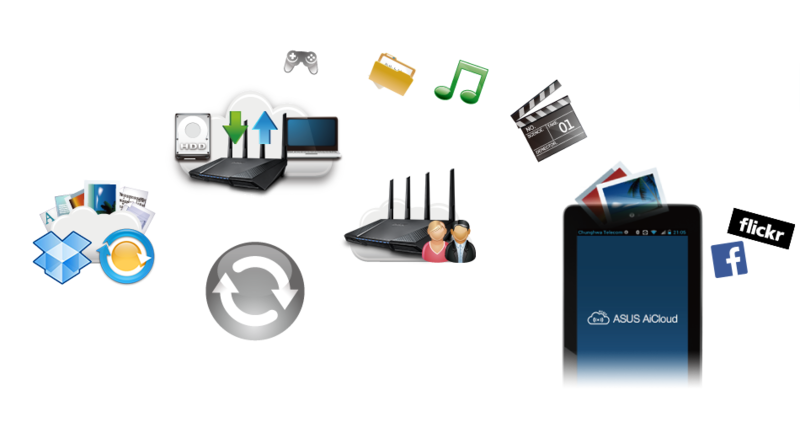 Even better, AiCloud can be connected to another compatible router to expand your personal cloud even further.